or to two significant figures, v = 1.9×102 m/s. where g is the gravitational acceleration constant, and L is the length of the string attached to the pendulum bob, assumed to be an ideal point mass. Increasing the length by a factor of two will increase the period by a factor of sqrt(2.0) = 1.4. [3.0 points.] A graph of kinetic energy versus time for an object in SHM is shown at right. What is the earliest time that the object will be located at equilibrium? An object in simple harmonic motion will be momentarily stationary (and thus have zero kinetic energy) at its x = +/- A amplitude endpoints, and have its fastest speeds as it passes through equilibrium (x = 0). Since the kinetic energy graph already has it maximum value at t = 0 s, that is the earliest time that the object is at equilibrium. An object in simple harmonic motion will be momentarily stationary (and thus have zero kinetic energy) at its x = +/- A amplitude endpoints, and have its fastest speeds as it passes through equilibrium (x = 0). Since the kinetic energy graph does not have its maximum value until t = 2 s, that is the earliest time that the object is at equilibrium. where F is the tension in the string, while mu is the linear mass density (mass per unit length) of the string. where L is the length of the rope. Thus doubling the tension F would increase the wave speed v by a factor of sqrt(2) = 1.4, and thus the fundamental frequency f_1 would also increase by the same 1.4 factor. (B) the turn-off point on an H-R diagram. (C) width of their absorption spectra lines. The most massive stars left on the main sequence line on an H-R diagram gives the age of the star cluster, because all the stars started their formation at the same time, and the more massive stars have shorter lifetimes (and leave the main sequence line faster) than the less massive stars. Response (A) would determine the distance to stars; response (C) would give an indication of their densities/luminosity class; response (D) would be correlated with the surface temperatures of these stars. Which wave parameter(s) increase if the cord were made more taut? where F is the tension in the rope, while mu is the linear mass density (mass per unit length) of the rope. where T is the period (which is the inverse of frequency). So if tension F increases, the wave speed v will increase (while the frequency remains constant), and also the wavelength will increase as result of the increase in v.
A wave has a frequency and wavelength of 200 Hz and 0.75 m, respectively. If the frequency of the wave source is changed, which wave parameters(s) will change as a result? 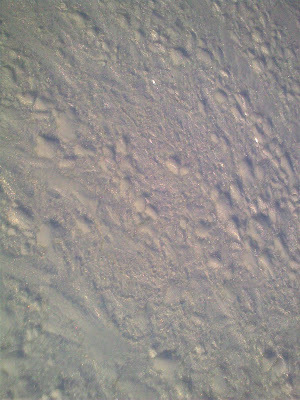 (B) The speed of the wave. where T is the period (which is the inverse of frequency). So if frequency changes, the wave speed will still remain constant, but the wavelength will as a result change. (A) not appear to contain dark matter. (B) not have absorption lines that are redshifted. (C) have type Ia supernovae that explode slowly. (D) appear as it did in its past. Due to the finite speed of light, a galaxy that is n light years away will appear to us as it did n years in the past, when that light first left that galaxy. __________ is evidence that the universe is not expanding like an explosion. (A) The finite speed of light. (B) The night sky is dark, and not blindingly bright. (C) Galaxy redshifts are proportional to galaxy distances. (D) Matter and antimatter annihilate to convert into energy. In an explosion, debris travels slower as it gets farther from the explosion, which is the opposite of what is actually observed, which is Hubble's law (response (C). Response (A) is the cause of lookback time, and response (B) is Olber's explanation of why the universe cannot be infinite in extent. A similar version of this question was asked on a Final Exam in Spring 2008. Instructor: (Seeing a student quickly counting up all elements on the worksheet) "Look at you--getting all Rain Man on this." Student 1: "I am an excellent driver." Student 2: "You so did not just quote that movie, did you?" A 0.40 kg object on a 99 N/m spring oscillates left to right on a frictionless surface, with an amplitude of 0.10 m. What is the speed of the object at the equilibrium point? such that v_max = sqrt(k/m). Response (B) is the period T = 2*pi*sqrt(m/k) of this mass-spring system, and (D) is the maximum acceleration a_max = (k/m*)*A. Student: "...so can we still see these stars, even though they're already dead?" Instructor: "What? You want to watch the stars when they die?" [3.0 points.] Water at point  flows with a speed of 0.75 m/s through a pipe of 0.20 m inner radius. The pipe at point  tapers down to an inner radius of 0.050 m. Assume ideal fluid flow. The pressure of the water __________ as it flows from point  to point . the water speed at point  is greater than at point , because the cross-sectional area at point  is smaller than at point . 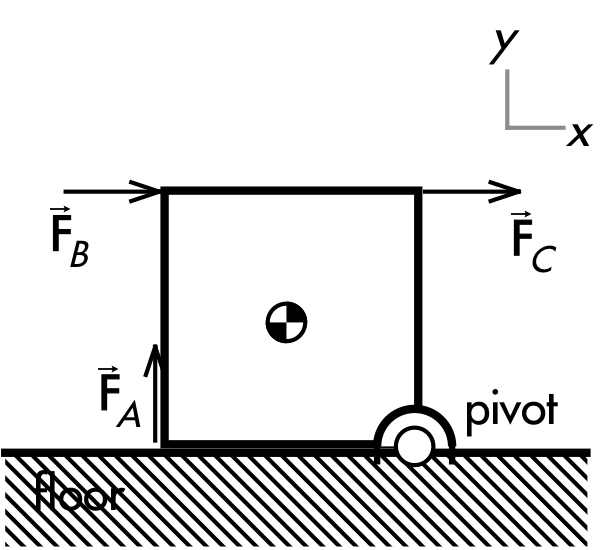 the kinetic head (the second term on the right-hand side) increases due to the increase in speed from point  to point , while the gravitational head (the third term on the right-hand side) remains constant due to no change in elevation along the horizontal pipe, thus the pressure must decrease as water flows from point  to point . (A) FA (applied horizontally at corner diagonal to the pivot). (B) FB (applied horizontally at corner above the pivot). 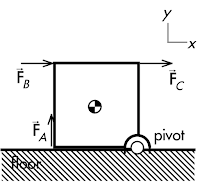 (C) FC (applied upwards at corner left of pivot). All three applied forces have the same magnitude. Also, they all have the same perpendicular lever arm ℓ, drawn from the pivot to intercept their respective lines of forces perpendicularly. Thus for each of the three forces, they have the same magnitude torque τ = ℓ·F. [3.0 points.] Four uniform rods with identical masses, and equal lengths are arranged as a long two-bladed fan, or as a shorter four-bladed fan, as shown at right. Which fan blade arrangement has the largest rotational inertia? For a thin, uniform rod of mass M and length L, students were given that the rotational inertia about an axis through its center, perpendicular to the length is given by Icenter = (1/12)·M·L2; while the rotational inertia about an axis at one end, perpendicular to the length is given by Iend = (1/3)·M·L2. Itwo-blade = 2·Iend (where M = 2·m, L = 2·l) = 2·(1/3)·(2·m)·(2·l)2 = (16/3)·m·l2. Ifour-blade = 4·Iend (where M = m, L = l) = 4·(1/3)·m·l2 = (4/3)·m·l2. [3.0 points.] Four uniform rods with identical masses, and equal lengths are arranged as a long two-bladed fan, or as a shorter four-bladed fan, as shown at right. Which fan blade arrangement has the smallest rotational inertia? Which star's light takes the shortest time to travel to us? Since these stars are in the same cluster, and are all located at the same distance away, light from all three stars will take the same amount of time to travel to us. Which star's supernova explosion (type II or type Ia) was/will be observed last by us? Massive stars will have shorter main sequence lifetimes, while low-mass stars will have longer main sequence lifetimes. Since these stars are located in the same cluster, and thus were born at the same time, and are located the same distance away from us, the lowest-mass star will be seen to end its main sequence lifetime last. Two objects (same volumes, same densities) are held either half- or fully-submerged in a tank of water. It is not known whether these two objects are both lighter or denser than water. Which object has the greatest bouyant force exerted on it? where rho is the density of the fluid, and V is the volume displaced by the object--the volume of the object that is submerged under the surface of the liquid. 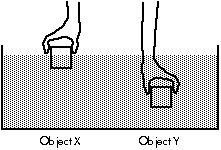 Thus regardless of the density of the objects, and whether the hands are lifting or pushing down on these objects, the submerged object experiences a greater bouyant force than the partially submerged object. "Surface of Enceladus (Speculative)" (hoarfrost on a car trunk, Atascadero, CA). Photo by Cuesta College Physical Sciences Division instruction Dr. Patrick M. Len. 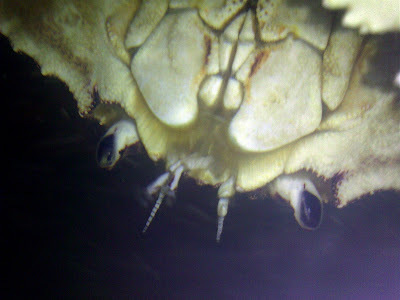 "Enceladan Life (Speculative)" (live crab at Pier 46 seafood market, Templeton, CA). Photo by Cuesta College Physical Sciences Division instruction Dr. Patrick M. Len. 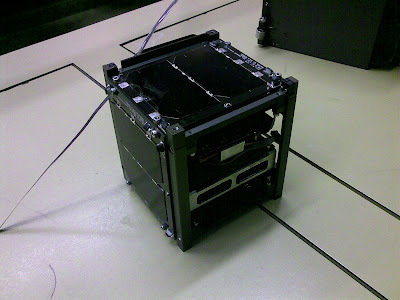 CubeSat on display, at the March 2009 meeting of the Central Coast Astronomical Society, Cuesta College, San Luis Obispo, CA. Photo by Cuesta College Physical Sciences Division instruction Dr. Patrick M. Len. 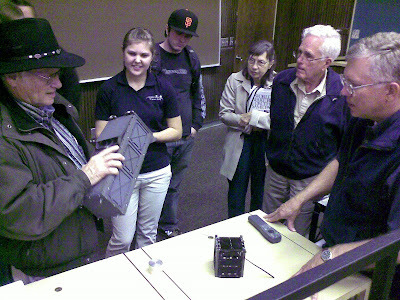 Central Coast Astronomical Society members and bystanders inspect a CubeSat P-Pod payload deployer, with a single CubeSat on display on the tabletop, brought in by Cal Poly student Marissa Brummitt (visible second from left). Photo by Cuesta College Physical Sciences Division instruction Dr. Patrick M. Len. 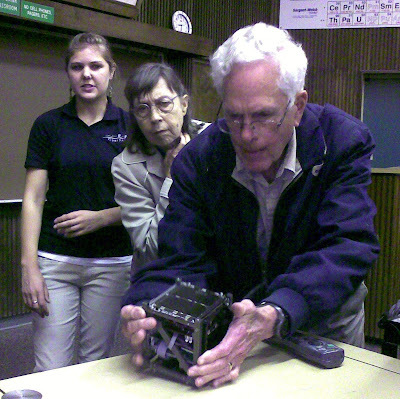 Central Coast Astronomical Society members and bystanders inspect a CubeSat P-Pod payload deployer, with a single CubeSat on display on the tabletop, brought in by Cal Poly student Marissa Brummitt (fourth from left). Photo by Cuesta College Physical Sciences Division instruction Dr. Patrick M. Len. 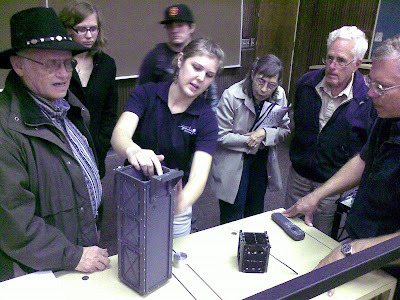 Central Coast Astronomical Society members and bystanders inspect a CubeSat, under the watchful eye of Cal Poly student Marissa Brummitt (left). Photo by Cuesta College Physical Sciences Division instruction Dr. Patrick M. Len. 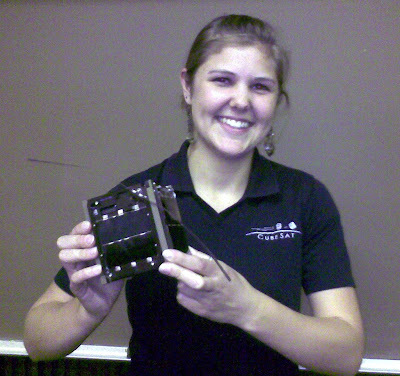 Cal Poly student Marissa Brummitt displays a CubeSat at a Central Coast Astronomical Meeting. Photo by Cuesta College Physical Sciences Division instruction Dr. Patrick M. Len. Baumanometer® blood pressure gauge (sphygmomanometer), La Posada Medical Plaza, Templeton, CA. Photo by Cuesta College Physical Sciences Division instruction Dr. Patrick M. Len. (A) increase in pressure inside the bag. (B) decrease in pressure outside the bag. The principal cause of the bag "inflating" is the decrease in pressure in the air surrounding the bag as it is brought to a higher elevation. The pressure inside the bag then is greater than the ambient pressure outside. The absolute pressure inside the bag could increase due to an increase in temperature (using the ideal gas law), which is what some students discussed in choosing (C). The H-R diagrams of three possible or impossible star clusters are shown below. Massive stars will evolve the quickest, reaching the upper part of the main sequence line first, staying there the shortest amount of time, and then leaving first, compared to the low-mass stars, which evolve the slowest, reaching the lower part of the main sequence line last, and then staying there...and remain there, as the universe has not been around long enough for low-mass stars to have exhausted their main-sequence lifetimes. Thus star cluster Z is impossible, as it still has massive stars remaining on the main-sequence at the same time that the low-mass stars are on the main sequence. The H-R diagrams of three star clusters are shown below. Massive stars will evolve the quickest, reaching the upper part of the main sequence line first, staying there the shortest amount of time, and then leaving first, compared to the low-mass stars, which evolve the slowest, reaching the lower part of the main sequence line last, and then staying there...and remain there, as the universe has not been around long enough for low-mass stars to have exhausted their main-sequence lifetimes. Thus star cluster X is younger than both star clusters Y and Z, which have massive stars that already left the main-sequence, and low-mass stars that already reached the main sequence. Costco fuel station pavement arrow, San Luis Obispo, CA. To eventually accompany a planned photo, "Resolve Diagonal Vectors Into Orthogonal Components"). Photo by Cuesta College Physical Sciences Division instructor Dr. Patrick M. Len.